The Government of India first proposed the designation and development of a diplomatic colony, or enclave, for the permanent accommodation of diplomatic missions in 1946. By 1950, a large area just south of Government House (the former Viceroy’s House) had been selected, and was named Chanakyapuri after the ancient statesman and philosopher Chanakya. The roads were later named after Chanakya’s principles (like Shanti, Nyaya and Satya). Here, sites would be available to missions on perpetual leasehold terms with annual ground rent payable, and the Government of India would build all the infrastructure. General Sir Archibald Nye, who had succeeded Shone as high commissioner in 1948, argued to the Commonwealth Relations Office that, distasteful – even repugnant – as such an enclave would be for all diplomats, and expensive for all governments, there was in practice no alternative to ‘putting in our stake while we may’. His arguments were accepted in London. Nye’s arguments were accepted in London, including by the Treasury who made a £75,000 provision in the estimates. The high commission earmarked two possible sites ‘on the strict understanding that such earmarking must not be interpreted as a definite undertaking to acquire land.’ The Indians proceeded surprisingly rapidly with the infrastructure, and introduced a slightly more favourable commuted ground rent formula. The estimated UK requirement for 24 acres for offices for the 115 UK-based and 200 locally engaged staff, and residential accommodation for the UK staff and their domestic servants, was substantiated. 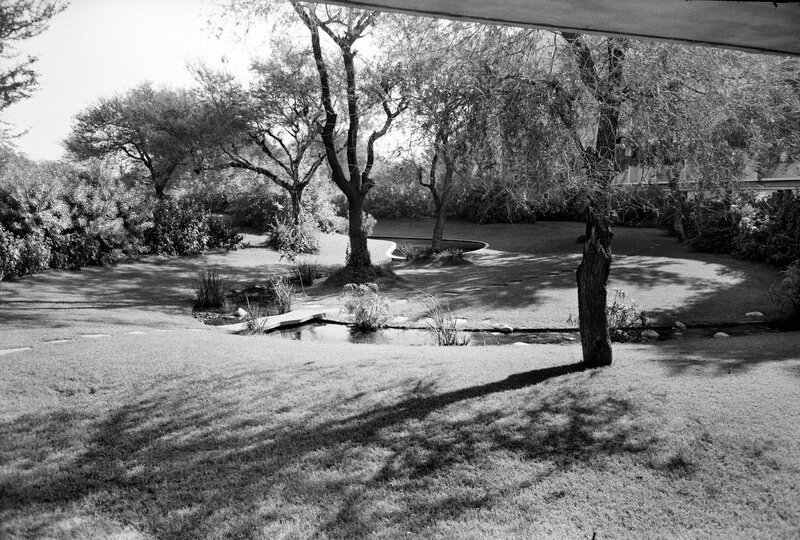 In September 1950 the newly-arrived Ministry of Works architect, Alex Tough, proposed the selection of a site lying along the central vista that he thought was better than either of the provisionally earmarked sites: it comprised 29 acres but he thought that its northernmost 5 acres could be lopped off, leaving the high commission with four increments of six acres. The Indians agreed in principle, and suddenly the pace hotted up because the high commission was desperate to make a start on building junior staff accommodation on the site. In October, the Treasury authorised taking up to 20 acres of the now-preferred site while accepting that, if the Indians refused to deal in less than six acre increments (which everyone knew they would), 24 acres would, reluctantly, be permitted. And so it was. Treasury also preferred the commuted rent formula, which eventually worked out at a capital premium payable of £156,650 for 24.11 acres of land, and a nominal annual ground rent. The address of the site was (and remains) Plot 3, Block 50C, Chanakyapuri, New Delhi. By mid-1952, the Indian government was pressing missions for progress in developing their sites because it in turn was under pressure to release requisitioned premises, a programme that had itself been delayed. The first requirement for the high commission remained staff accommodation and associated infrastructure. 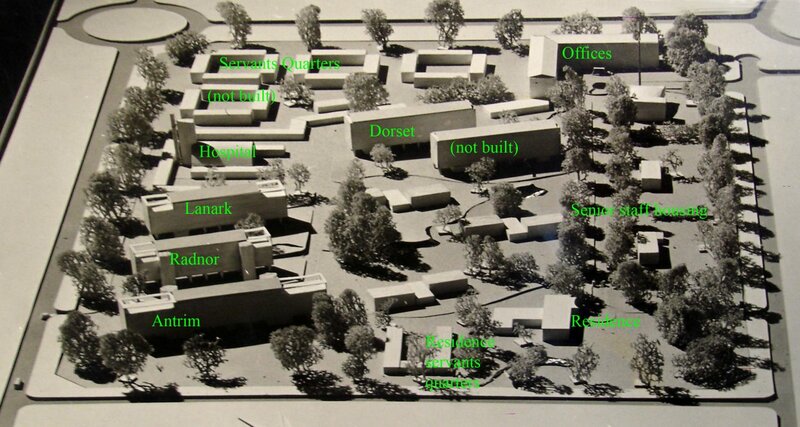 Reginald Mills, the Ministry of Works senior architect of the embassy offices in Bonn and elsewhere, produced an overall compound plan and designs for the first few buildings, for which a model was ready by September 1953. By and large, this was the scheme that came to be built. A north-south avenue connected the offices at its south end with the residence at its north. Three houses for the most senior staff lay along the west side of the avenue and all the other staff accommodation, amenities and domestic staff quarters were relatively evenly spread across the rest of the site to the east. Mills was careful to orientate the blocks of flats to avoid the low sun and to catch as much breeze as possible, not least by raising them on stilts. Model of final sketch plan for compound layout, 1953. The scheme was criticised on various counts, seriously enough to merit a visit to New Delhi in November 1954 by Edward Muir, deputy secretary at the Ministry of Works, and Richard Turner, assistant chief architect: ‘We found that [the Post] were in a state of very great apprehension as a result of looking with an uninformed eye at the plans and layout which had been sent to them. … Basically, the High Commissioner’s [Sir Alexander Clutterbuck] objection is to the whole concept of building a housing estate for the staff ’. More realistic were complaints that the layouts of both the compound and the flats were too cramped: leaving out the residence would be an obvious way of freeing up some space. By 1955, however, more flats were becoming available to rent on the Delhi market, though their quality was poor, and so the housing pressure on the compound was easing. In early 1955, the final scheme was presented to Ministers, who professed to like it, and to the Royal Fine Art Commission, which was lukewarm but could be politely ignored. There were no UK contractors working in India, nor Indian contractors who could be sufficiently relied upon, so the Ministry of Works opted to build the compound with a large directly-employed labour force under its own supervision and to accept full financial responsibility. 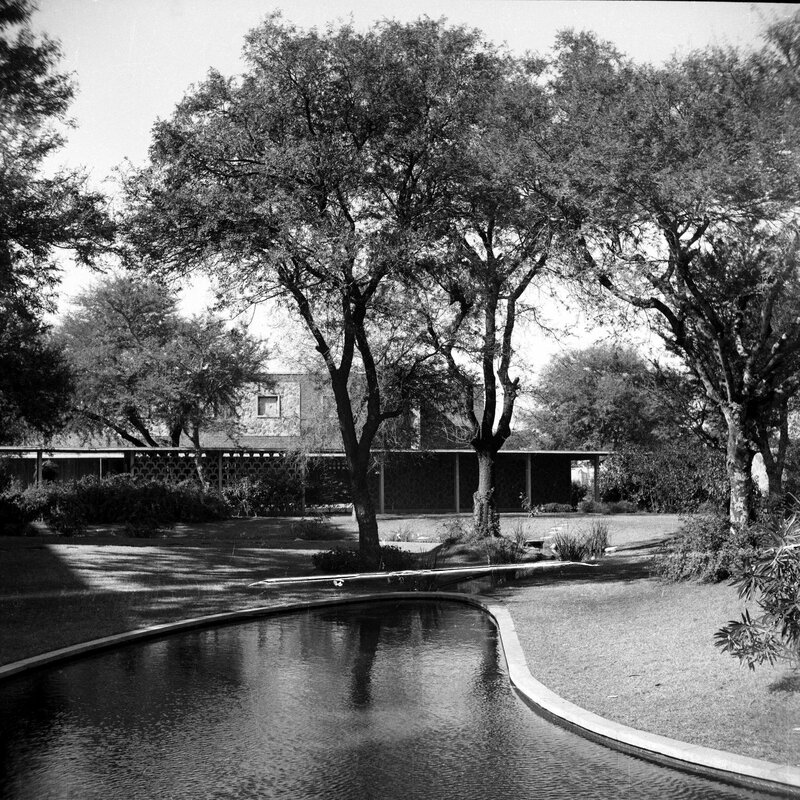 The compound was built in three phases. 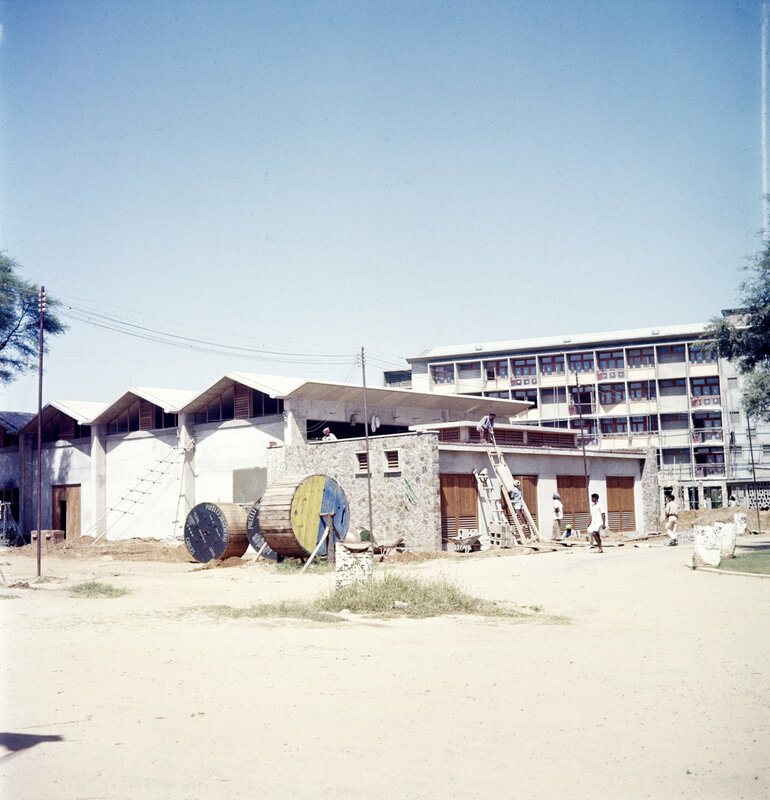 The first phase started on site in December 1955, under the managerial control of a senior Ministry of Works site control officer, A Watson, and comprised the boundary wall, roads and services infrastructure with plant house, 54 flats for middle and junior grade UK staff in three five-storey blocks, and sick bay, community centre, swimming pool and servants’ quarters. This phase was completed and occupied by the time that the Prime Minister, Harold Macmillan, laid the foundation stone for the office block in the second phase in January 1958. This phase, which took until 1960, included all the offices, workshops and garages. 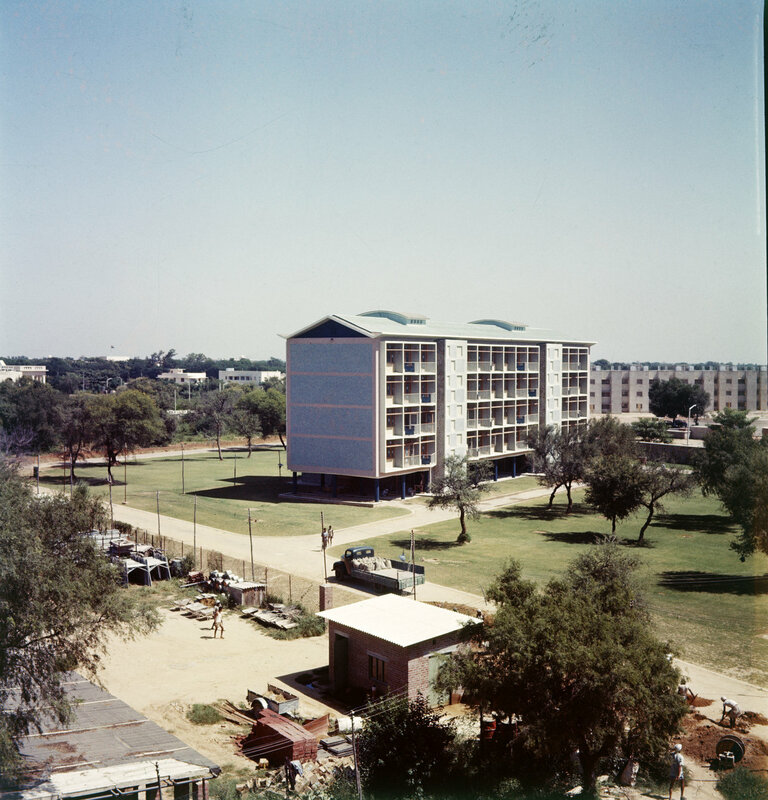 The third phase began in 1960 and included the fourth block of flats and six houses for senior staff: it was completed in 1962. Full occupation of the compound was achieved in the same year, fifteen years after independence. Recently completed compound, from Ashok Hotel, 1962. 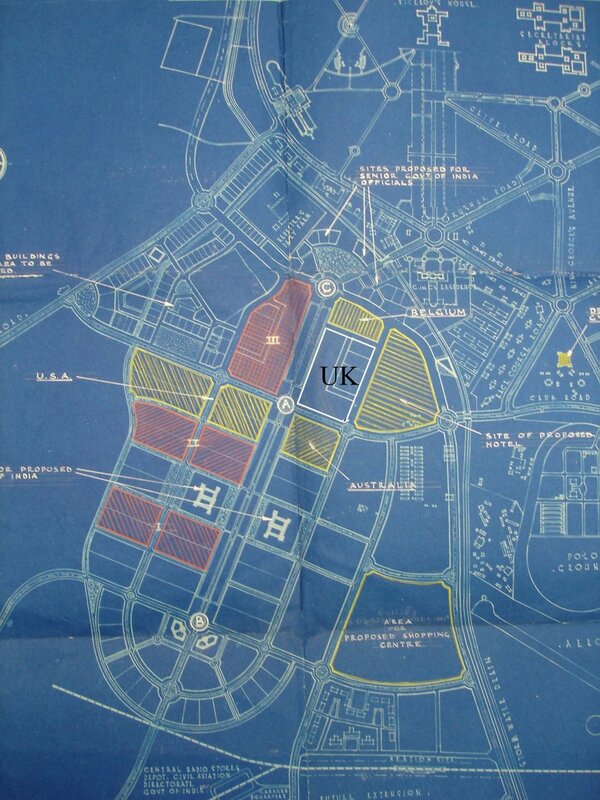 Diplomatic enclave plan, with final UK site selection, 1950. 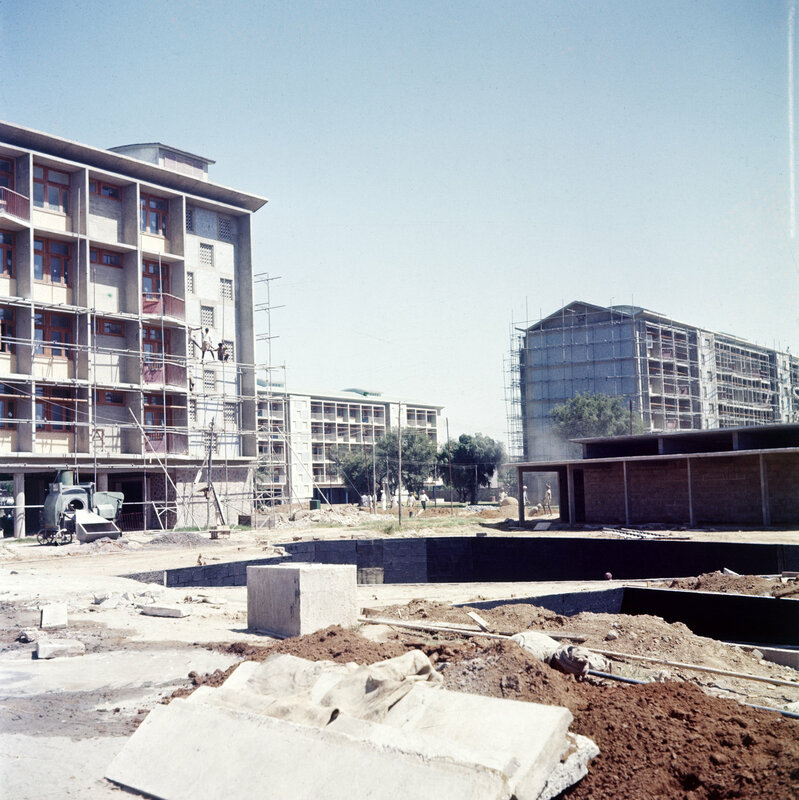 Staff flats block, under construction, 1957. 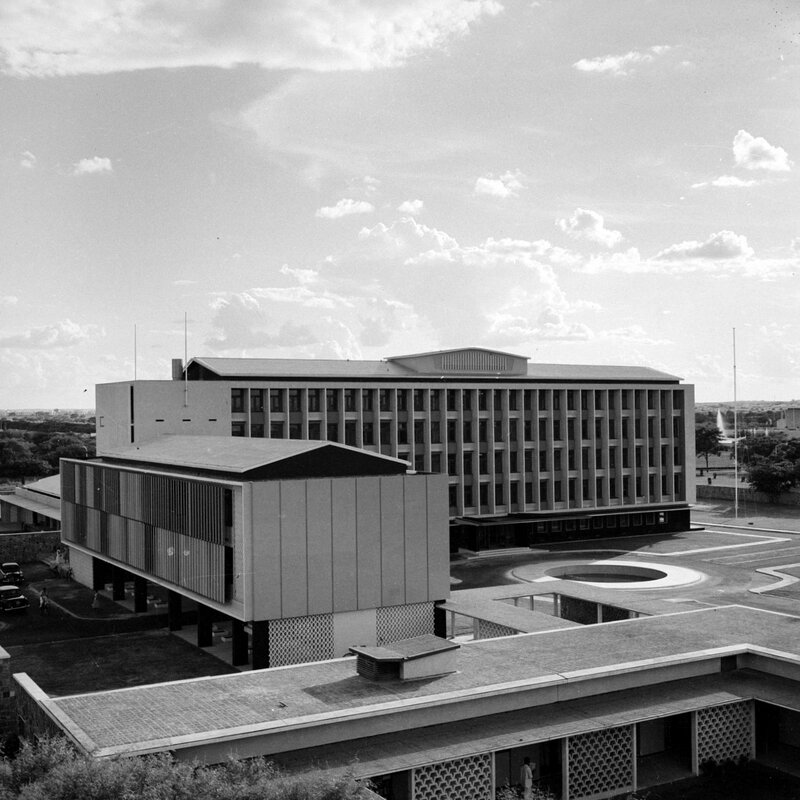 Services building, under construction, 1957. 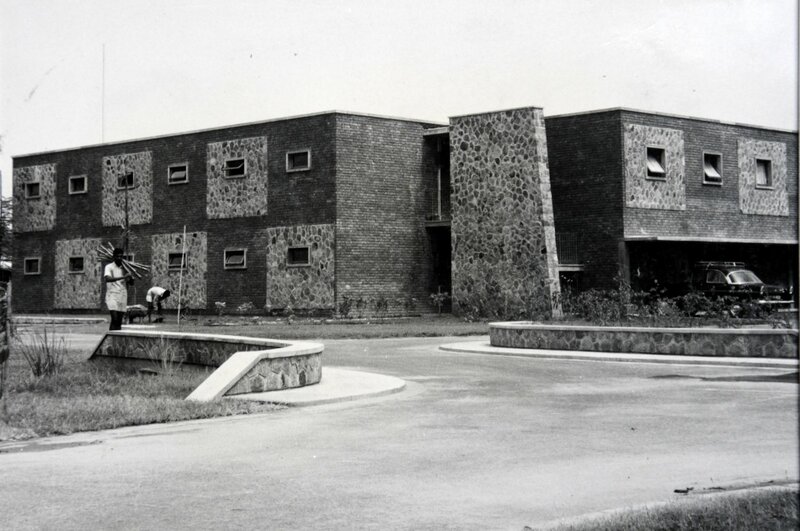 Staff block, just completed, 1957. 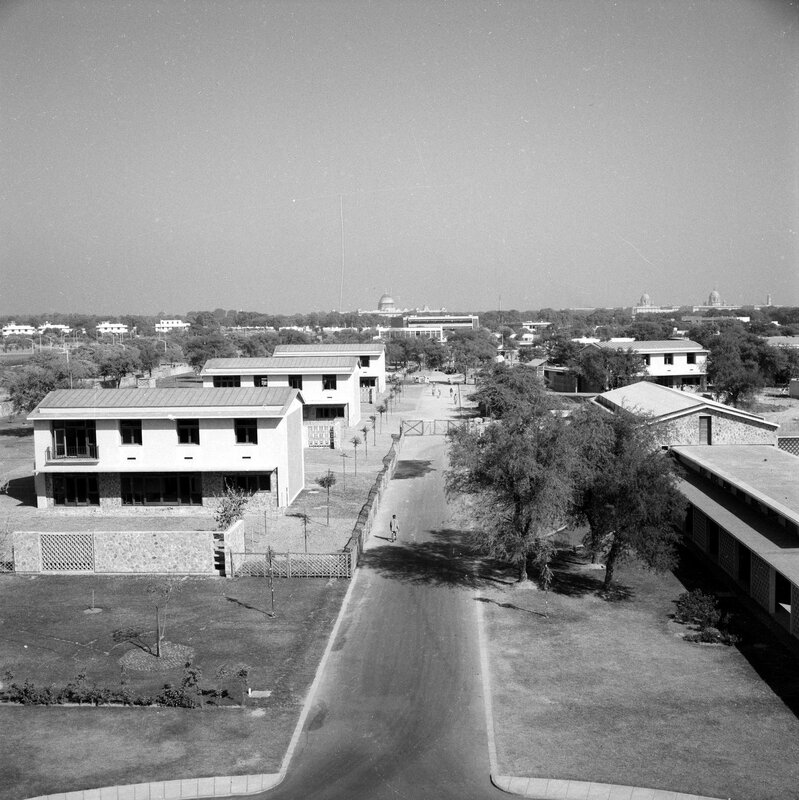 View north from offices, towards residence site, with Lutyens and Baker domes in the distance, 1960. One of four less than gracious domestic staff blocks, 1960. The offices, from Dorset House (from north-east), 1959. 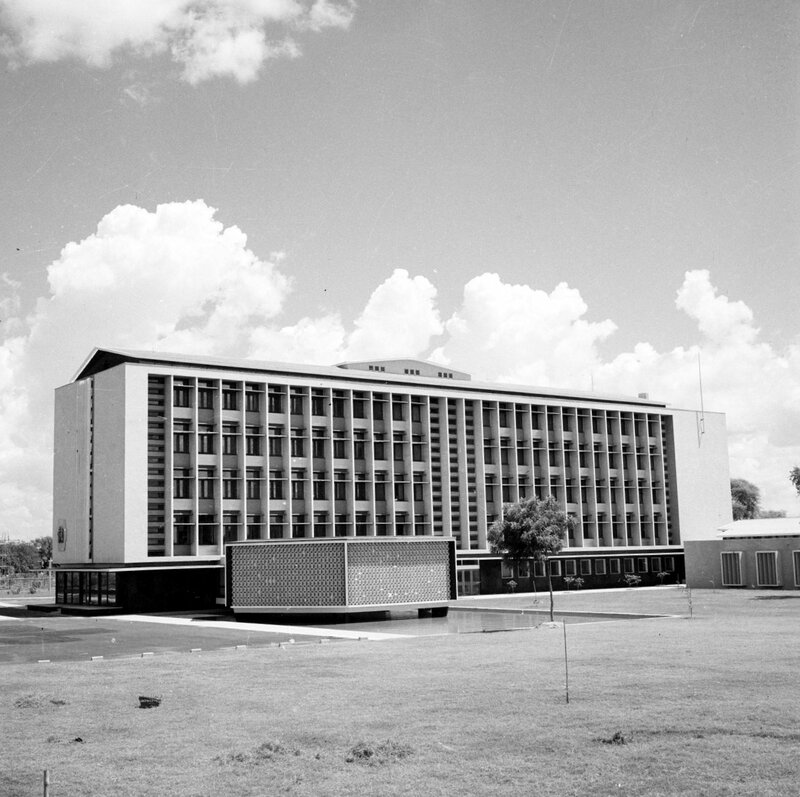 Offices, from the south-west , with library, 1959. 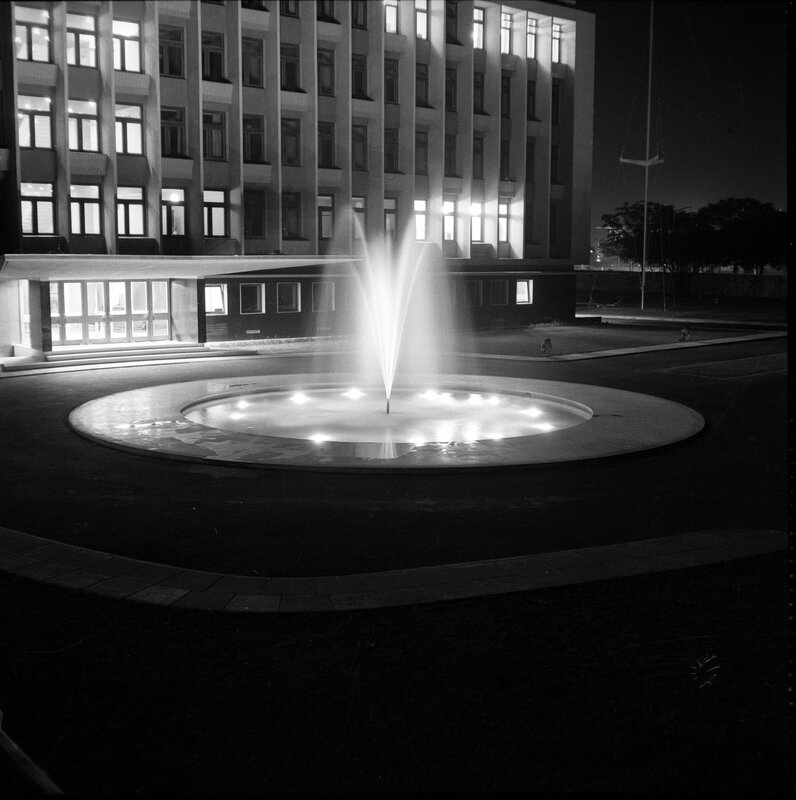 Turning circle outside offices, at night, 1959. 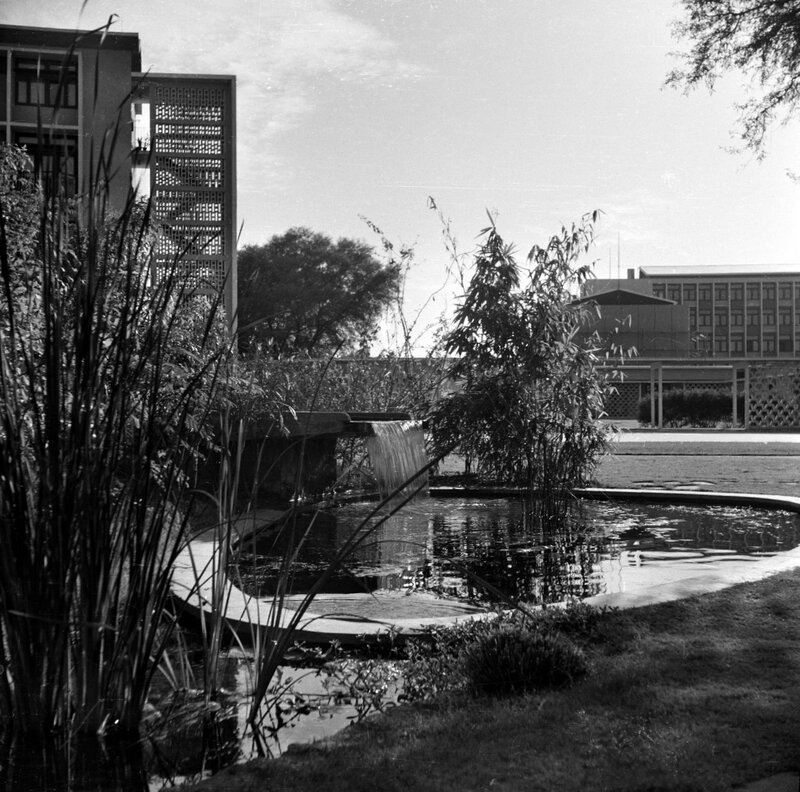 Head pool, with Dorset House behind, 1961. Stream, as it nears Antrim House, 1961. 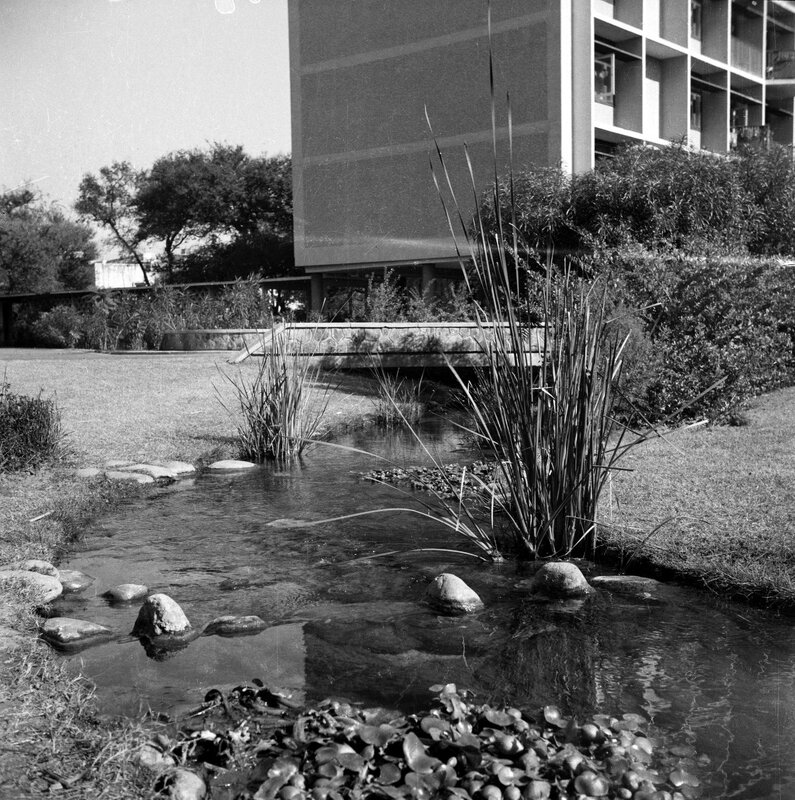 Bottom pool, with local staff block beyond, 1961.